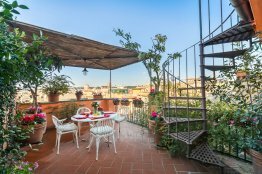 The neighborhood of Piazza di Spagna offers one of the most important monuments of Rome: the Spanish Steps. 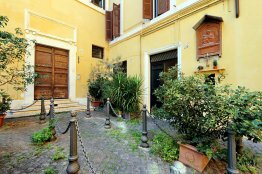 They have always been and will continue to remain, one of Rome’s most popular attractions. 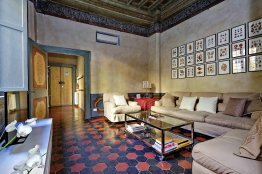 Some will remember seeing them for the first time in the classic “Roman Holiday“! 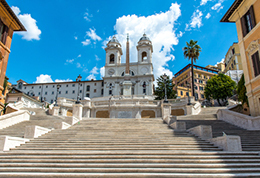 Europe’s widest staircase links, with its 135 steps, Piazza di Spagna at its base to Piazza Trinità dei Monti at its top. 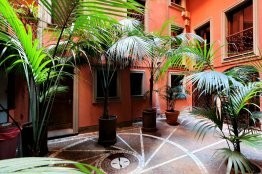 The splendid fountain called “Fontana della barcaccia” sits proudly at the foot of the staircase. 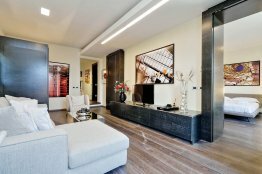 This area of Rome is also where you’ll find the largest concentration of big designer names: Prada, Gucci, Valentino, to name only a few! 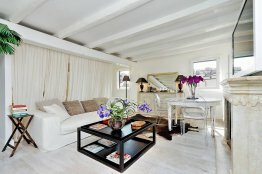 Trend followers will love having their Roman apartment near Via Condotti, the main shopping street of the city center. 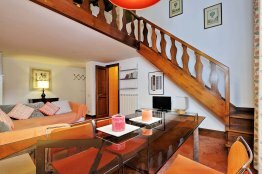 After going up the Spanish Steps and around the chic boutiques, you may want to head to Babington’s Tea Room and enjoy some down time with a cup of tea. 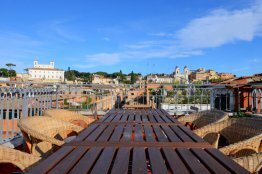 Finally, when the sun is about to set, make your way to the gardens of Villa Borghese and marvel at the breathtaking sight of the Eternal City from atop the Pincio. 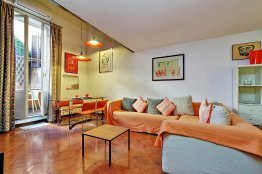 This Rome Pantheon apartment has a great central location close to some of the most famous tourist sites in the city. 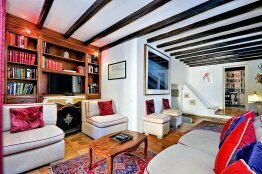 However, it is situated in a quiet and peaceful cobbled street, tucked away next to a beautiful church. 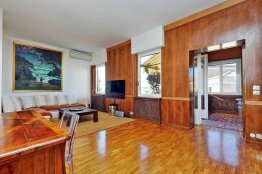 This elegant and spacious apartment has high wooden ceilings and bright teak floors. 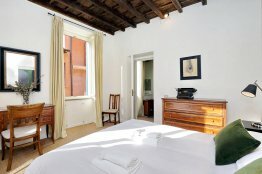 You will find it on Vicolo dei Serpenti, one of the most charming streets of the Monti area. 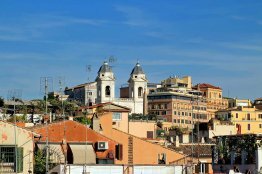 This location is very safe… your neighbor is the Italian ex-president: Mr. Napolitano himself! 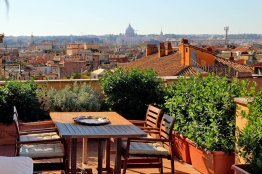 Spread across the top 2 floors of a classic Roman building, this spacious Rome Pantheon penthouse is the ideal home away from home. 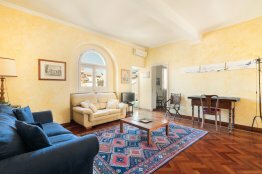 This luxurious spacious terrace apartment sits just steps away from Piazza Barberini. 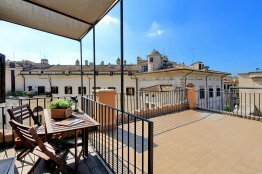 The best part of this Roman apartment is its wonderful panoramic terrace where you can watch the view and spend your leisure hours with a refreshing drink, slowly sinking into the comfort of cushioned sofas. 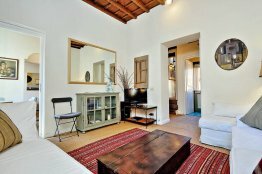 You will find this inviting Pantheon house apartment on Via dell’Orso, near the Pantheon. 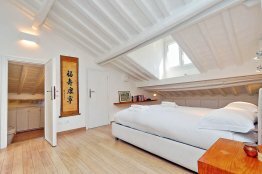 You can access the apartment on the second floor of an elegant building that has a lift. 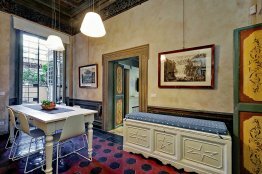 Recent renovation has added Sicilian architectural details like the white majolica floors. 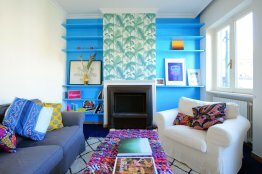 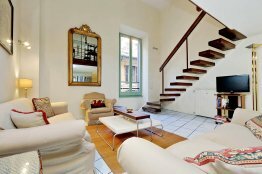 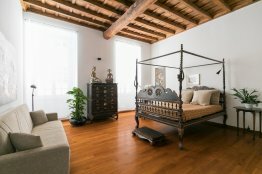 You can find this charming Rome rental apartment in one of the most wonderful areas of Rome. 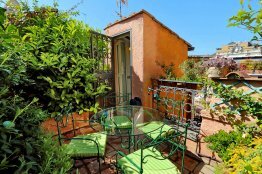 It is an ideal base for your Roman holiday! 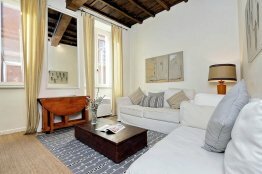 This Campo Marzio studio apartment lies in Vicolo della Torretta. 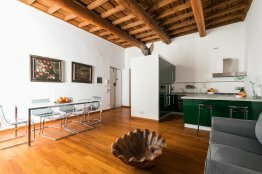 The studio is on the 1st floor of a seventeenth-century building that has an elevator. 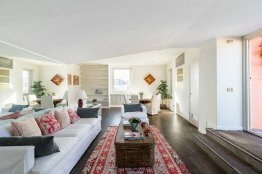 It stands on two levels.